Speech and Language therapy provides support for so many different things, making it difficult for many people to understand what we do. With school age children, the most popular areas of need for therapy involve speech production, pragmatics, receptive, and expressive language. 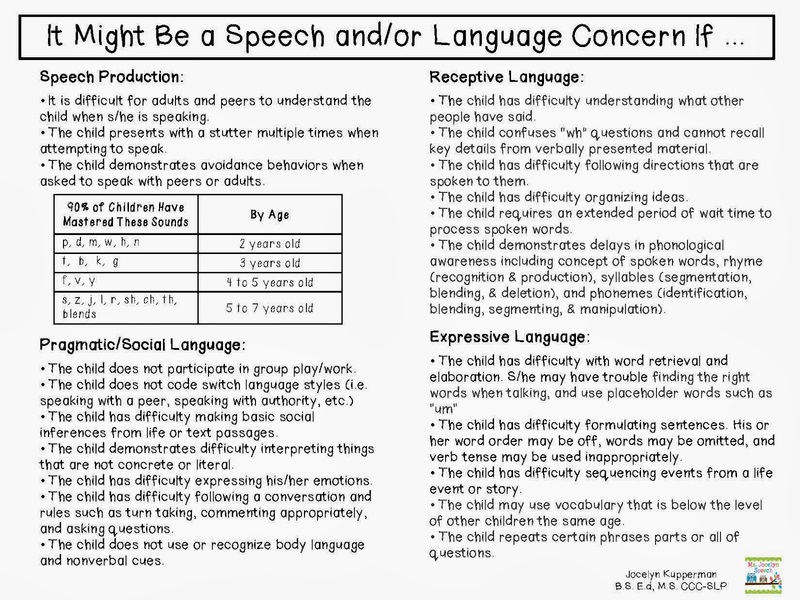 After working and speaking with many educators and families, I have compiled a helpful handout that outlines some of the more popular difficulties demonstrated by school age children with speech and/or language impairments. It's a great tool to share with colleagues as part of RtI or families looking to identify if therapy is the right choice for their child. You can grab a pdf copy here! I was searching on the PediaStaff pinterest board for SLP and came across this post that was pinned there. We live overseas, and I am homeschooling my son, so my resources for speech therapy are a bit limited. He will be 6 in August, and the only thing that seems to be a problem is making the /r/ sound. I don't want to let it get ahead of us in terms of intervening if he would benefit from some help, but I also don't want to panic if it isn't really a problem yet. Do you have any advice on whether to wait or work on some exercises to help him with it? If working on it would be good, do you have or know of resources that would help me work on it with him? I have a degree in education, but I have no background in SLP and limited resources here, so I would greatly appreciate any advice that you might have!